Last edited by Pharthan on Fri Nov 28, 2014 3:41 am, edited 3 times in total. Last edited by Pharthan on Sat Feb 07, 2015 1:55 pm, edited 1 time in total. The AH-24B Fennechawk is a two-seat coaxial rotor compound attack helicopter constructed by Halcyon Arms. While primarily designed as a stealthy, high speed attack helicopter, the Fennechawk also fills reconnaissance roles. While not intended to, it may also carry air-to-air weaponry, though this is usually for self-defense rather than a primary role, though it can easily take down other helicopters. 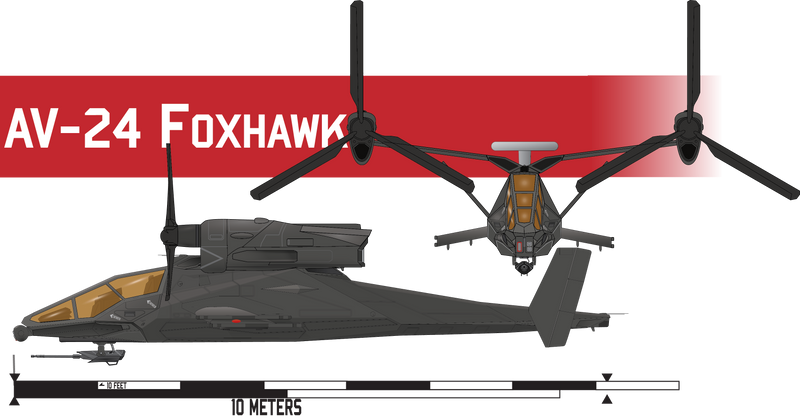 With it's high speed, the Fennechawk is also quite capable of escorting other helicopters, with the ability to maneuver about the battlefield to engage threats at will. The AH-24B Fennechawk is the culmination of all of the previous models in the -24 line of rotary aircraft. It varies little from it's AH-24 Fennec parent, except for one key detail; it's pusher-propeller, which is powered by the main engines. The torque is automatically counter-acted by the coaxial rotors, keeping the aircraft stable. This gives it a considerable speed advantage over it's predecessor. 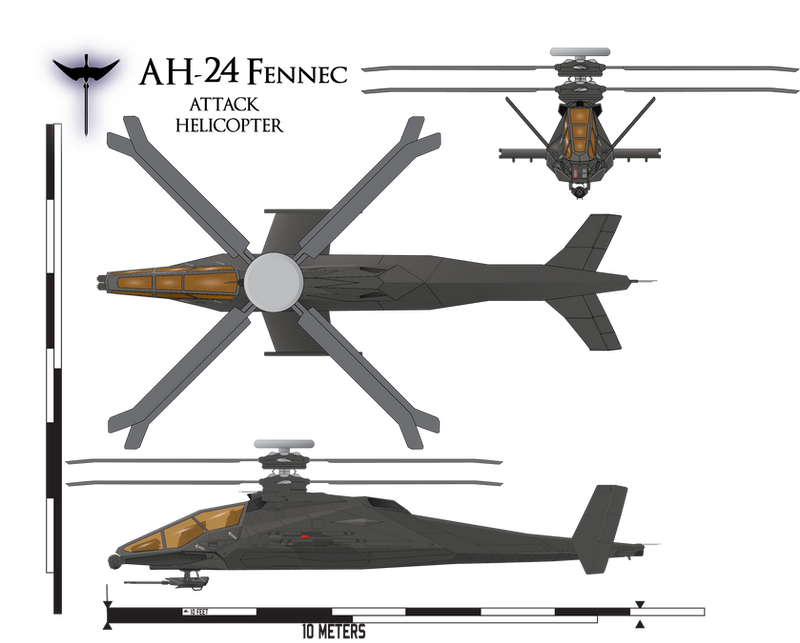 As well, whereas other helicopters must either tilt their rotors or bodies to accelerate, the Fennechawk can immediately move from hover to forward or reverse motion by engaging it's pusher-propeller. This helps to assist it in avoiding incoming fire, especially in urban scenarios where close-quarters anti-air missiles are a significant threat. Last edited by Pharthan on Sat Feb 07, 2015 2:29 pm, edited 5 times in total.